I'd like to ask for some help on behalf of one of my authors. Can anyone point me towards/send me good reliable information on the sword from the Tomb II at Vergina commonly ascribed to Philip II, please? I need as much technical detail as possible: measurements, materials, method of manufacture. First I want to point out that the ivory "cross piece" belongs to the hilt,not the sword itself. It just wasn't clear from Paullus' phrase. In the Tomb II of Vergina there were two more swords that I have looked closely twice. They are identical to the one shown here except for some details. They were burnt with the body thus nothing of the scabard survives. In the place of gold in the guard there was solid iron that must have been separate from the blade. So one could assume that the gold guard is solid in the two ends and the decoration in the middle is of thin gold. I cannot figure out how they made this with either gold or iron but the two solid pieces and the decoration in the middle were one piece,it can be seen from the photo and it was the same when I saw it up close. From the iron piece of the hilt(the continuation of the blade) there were two pins emerging,one very near the guard(and in the photo there is a tiny circle in the base of the gold decoration) and another one near the pommel. These secured the wood or bone that was not preserved probably because of the fire. A detail is that the hilt plates were also secured under the guard in the middle. I may do a sketch later to make it more clear because it was rather complicated to describe it. The strange things with the sword in the photo is that the hilt appears to be of solid iron,something I have seen in kopides but not in the lead shaped swords. One explanation would be that the other two swords were much shorter than this one,so it was a matter of balance. Ok,I painted it as accurately as I could remember it(photos are not allowed in Vergina) and as much as my skills allow it. 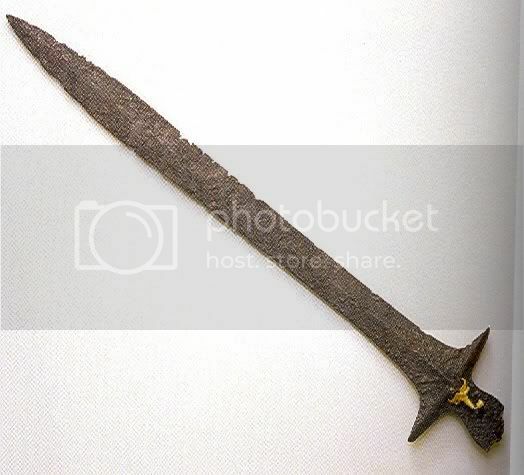 And I found a picture of one of the two swords I mentioned above. This one had some gold leaf decoration,the other one didn't. The lower hilt details I know from the other sword which was more intact. The other sword was of the exact same tecnique,from the same manufacturer I dare say,and was better preserved. It could be polished and sharpened only its blade needed to be straightened up a little. But the one here was a little smarter in my opinion,it has such delicate curves! Zoom in on that image and using my painting you'll notice the details. A nice angle of the hilt,it helps make out the exact sgape. Sorry for the bad quality,I took the picture from a video on youtube. And I made a reconstucted painting. At least aversion of it,with bone or ivory. It could be wood I suppose.But usually the hilts are shown white. Hi Gioi. I do it with the mouse. The two swords were displayed with the rest of the items that were burnt. The seeds and the horses etc. There is a theory that the bones show dry cremation which means they burned the bones alone,not the flesh. The pyre was not that big and not left enought to destroy everything. I don't know if the fire actually helped to the preservasion of the swords? No Gioi,i didn't mean that they burned hin twice. I meant that the bones were not those of Philip II because he was burnt once,soon after his death. Those bones were burried elsewere and were cremated after many years in the Macedonian fashion. This is one more reason they didn't need to let the fire for long and thus many bits and peices were preserved. I bid all this effort to paint the sword for nothing :? I had seen this photo ages ago and I hadn't realized that the little white card is going under the guard! It shows very clearly how they were made. This is a sword owned by John Piscopo. And this sketch also sheds some light.In the middle sword you can still see one of the pins on the hilt. John Piscopo said that the sword was one piece with the solid iron guard pieces.This is okey,what i cannot figure out is how the thin iron piece in the center was produced. Wow, thanks all of you for responding so quickly and helpfully.